Through the annals of footballing history, there have been a multitude of figures whose contribution to the game can be termed as colossal. Names such as Jimmy Hogan, Herbert Chapman, Victor Maslov, Rinus Michels, Arrigo Sacchi, have left their inedible mark on the sport through their philosophies of how the game should be played. But among these, the name of Valeriy Lobanovskyi has long gone unnoticed and underappreciated. His contribution to the game is as important and as ground breaking as any of the contributions of the rest of these eminent personalities. Born in Kiev in 1939, the young Valeriy was a smart kid, evidenced by his gold medal in mathematics which he was gifted when he left high school. Incidentally, it was this obsession with mathematics that would come to define his career. Lobanovskyi would later go on to study engineering at the Kiev Polytechnic Institute at a time when Kiev would be the center of the Soviet computer industry. It was here that Lobanovskyi learned about the latent capabilities of computers and would later define his career with his usage of them. Lobanovskyi, the player, was a dynamic, pacey and inventive left winger in the Victor Maslov created Dynamo Kyiv side of the fifties and sixties. He flourished until the team shifted to a wingerless 4-4-2, wherein he was unable to adapt to being played as a midfielder and eventually left the club. After a couple of clubs, he retired at the age of 29 in 1968 and embarked on a 32 year coaching career which would earn him worldwide recognition and fame. Even though he, as a player, had favoured individual expression, as a manager he propagated the school of thought that football was about the coalitions and connections that existed between the 11 players of a team. He broke down the game, saying that football was a system of 22 elements – divided into 2 systems of 11 elements, playing within the given area of the pitch and subjected to the rules of the game. Lobanovskyi joined Dnipro Dnipropetrovsk and though he did not win anything major there, he did guide them to the First Division in his third year and had them finish sixth in his fourth year. 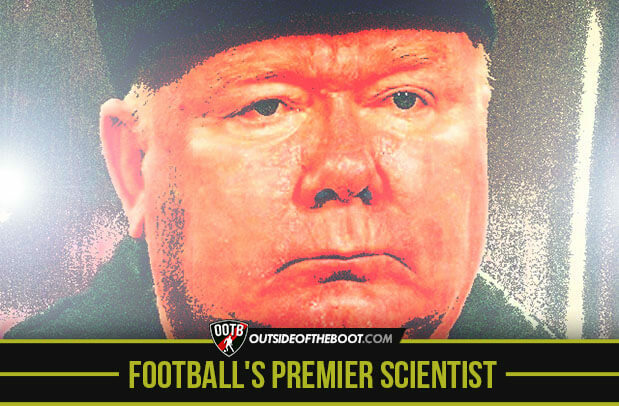 In his time there, Lobanovskyi met Anatoliy Zelentsov, a specialist in bioenergetics, who would go on to become his trusted right hand man and an integral part of his coaching setup wherever he went for years to come. The great Ukrainian claimed that his ambition was to achieve uniformity amongst his players; he wanted his forwards to be capable defenders and his defenders to be capable forwards. He also instructed his players in numerous pre-planned moves, moves which became embedded in Dynamo’s play and were able to be adapted to suit a variety of circumstances. Lobanovskyi was an advocate of the simple but golden rule of football which says that the best way to outplay your opponents is to vary the size of the playing area, i.e. make the pitch look bigger when in possession of the ball and smaller when not in possession. He also reverberated that the most important thing in football is what the player is doing when he is not in possession of the ball. His teams though didn’t always have a set method of playing the game, they would be capable of an intense pressing and attacking game, and at the same time would be content to sit back and counter attack. This tied in with his thought process of always looking for new ways to play and hence never be ‘found out’. His greatest achievement, though, will be his use of statistics and computers. Lobanovskyi and his team used computers to analyze games, composed training programs and evaluated player performances, in a scientific manner that had never been seen before in the game. Everything the player did was denoted by a number. There were a specific number of technical and tactical actions that a player was supposed to have fulfilled during the course of a match, and if he didn’t do it, well, the obvious conclusion would be that he hasn’t played well. As expected his strict regime and seemingly totalitarian rule resulted in a lot of players getting disillusioned with him and his methods. A fall out with many of his players and bad luck ruined his international career with the USSR. But nothing can take away from him the 13 League titles, 9 Domestic Cups, 2 UEFA Cup Winners Cup and a UEFA Super Cup that he won as a manager. He also reached the final of the European Championships where they were beaten by Marco van Basten’s wonder goal. Lobanovskyi passed away on 13th May 2002 after suffering a stroke in the aftermath of a game a few days earlier. More than 200,000 people attended his state funeral including Andriy Shevchenko and some of the members of his former teams, He was honoured with the title Hero of Ukraine, the nation’s highest honour and has also had Dynamo Kiev’s stadium named after him. In this age of Opta statistics and WhoScored ratings, it is difficult to appreciate the effect that Lobanovskyi had on the footballing fraternity at the time. He had a ceaseless desire to fuse science and football to create the perfect team, where the actions of every player was monitored so as to allow them to play at the peak of their abilities. He is the prototype of the modern football manager.